Making cupcakes is fun times. I enjoy it. It's great. I do it often in the morning because that's when I'm the most productive. You know what that means right? I eat cupcakes for breakfast. It's not good. Well, I mean it's good of course. It's great actually. But technically it's not good. I should probably be eating oatmeal, yogurt, fruit or scrambled eggs. Maybe when I stop making cupcakes I'll start eating oatmeal again. When will that be....? 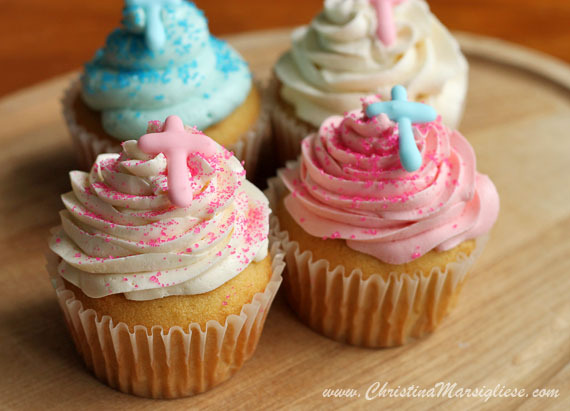 Anyway, I made these super cute cupcakes for a little girl's Baptism this past weekend. I made a few extra for breakfast of course. These guys are tiny little butter cakes topped with a silky smooth Swiss Meringue Buttercream and a candy cross made from royal icing. Have you ever heard of Swiss Meringue Buttercream? Some people like to call it SMBC. I'll just call it what it is....delicious. It's silky. It's smooth and perfect for piping. Sometimes I prefer not to use meringue buttercream for icing cakes because the continuous spreading motions just push all of the air out leaving you with what looks like buttered cake. You have to have a light hand and a lot of buttercream to do it correctly, because if you're working with too little, you'll try to make it spread farther and just flatten it out. For piping, however, Swiss Meringue Buttercream is a rock star. It takes a bit of practice. The first time around you might get scared. Beads of sweat may start to roll down your forehead as you watch your marshmallowy fluffy whipped egg whites turn into a grainy soupy mess. If you press on, and continue beating on high speed, emulsification will reign and you'll be left with a satiny frosting. The great part about this stuff is that you don't rely on the the sugar for thickening, as you do for American buttercream. So, you can actually control the amount of sugar which makes these types of frostings far less sweet. The sugar serves to stabilize the egg whites and makes this buttercream much more stable in hot weather than the American stuff. Adding the sugar right from the get-go creates a thick syrupy mixture that will encourage the formation of tiny air bubbles during whipping. Heating the egg whites not only serves to protect us from any possible food bugs, but helps to denature or unravel proteins which makes them more attractive to air. These tiny tiny air bubbles are what make the whipped egg whites look smooth, lush and creamy.....kinda like shaving cream. Give it a go! You'll be surprised. Preheat oven to 350°F. Line 18 standard muffin cups from two muffin tins with paper liners. In the bowl of an electric stand mixer, sift together flour, baking powder, baking soda and salt. Add sugar and mix on low speed until well blended. Add softened butter and beat on medium-low speed until butter is coated with flour and mixture resembles dry crumbs, about 3 minutes. Increase speed to medium and beat 30 seconds longer. In a medium bowl, whisk together eggs, sour cream and vanilla extract until smooth. Add to the flour mixture and mix on medium-low speed until moistened and the batter begins to form webs along the sides of the bowl and the beater, about 45 seconds. With mixer on low speed, gradually add milk and beat until batter is smooth, about 20 seconds. Scrape down the sides of the bowl and mix until batter is light, airy and creamy looking, another 15-20 seconds on medium to medium-low speed. Do not over mix. Divide batter evenly among muffin cups, filling them about two-thirds full. Bake until a toothpick or wooden skewer inserted into the center of the cakes comes out clean, about 14 minutes. Transfer cakes to wire racks to cool completely. In the heat-proof bowl of a stand mixer, whisk together egg whites, sugar and salt. Place the bowl over a pot with ½-inch of simmering water or a double-boiler and whisking constantly until the mixture reaches 70 degrees C (160 degrees F, about 5 minutes. Remove from heat and attach the bowl to the mixer fitted with the whisk attachment. Beat on high speed until it is completely cooled. This will take about 7-10 minutes and the mixture will appear white and fluffy like marshmallow. Note, do not begin adding butter until the bottom of the bowl feels neutral (not warm). Reduce speed to medium and add the butter slowly, one tablespoon at a time. Increase speed to medium-high and beat until creamy and smooth, 1-2 minutes. The mixture will go from looking grainy and soupy to smooth, silky and glossy. Scrape down the sides and bottom of the bowl, add vanilla and beat on high until well incorporated. beat on medium-high speed until whipped and smooth, about 1 minute. Cover with a damp cloth if using shortly. I'm making swiss meringue buttercream tonight, for the first time. Your cupcakes look amazing and are inspiring me! I've made swiss meringue before, but I've never even heard of swiss meringue buttercream! It sounds delicious, and your cupcakes look great! And even though 'productivity' is a dirty word to me, especially in the early morning hours, I'd change my ways if breakfast were to greet me with cupcakes crowned with swiss meringue buttercream. 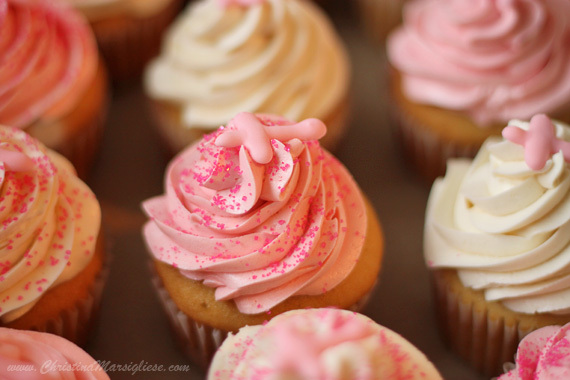 Your cup cakes look stunning and I love meringue buttercream. They look incredible! I love the photos, they are just gorgeous. These cupcakes are beautiful! They sound absolutely heavenly, vanilla has always been my favorite ;)! These are adorable. I love how you accented them in such a delicate way! How cute these cupcakes are! Love the swiss meringue buttercream too! 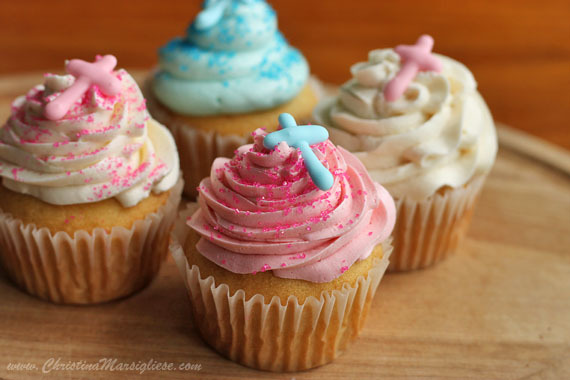 Those are too cute,and the icing recipe is scaring me! mmm I'm saving this! I've been wanting to try a different type of buttercream... I've seen french, Italian, and Swiss! You've convinced me to give this a go! I just made your cupcakes (with no swiss meringue) and they are the best vanilla cupcakes I have ever made! And I've made many. Thank you so much for the awesome recipe. I love your scientific approach to baking, it works amazingly!! Is this Swiss meringue frosting refrigeratable? I need help. the soupy, grainy mixture wont disappear. what can i do to fix this?